Following yesterday’s post on making London more dense, Tim Lund suggested I do a slightly more sophisticated analysis. Planners in London use a metric called the Public Transport Accessibility Level, or ‘PTAL’, which does pretty much what you’d expect. Rules for things like car parking levels and the density of housing you should build are based on these, because obviously if you’re in central London you have no need for a car and you can justify quite tall blocks of flats, but in low rise suburbia with only sporadic bus services it’s accepted that more car parking and less dense housing is appropriate. So if you were to follow these rules, how much more housing could you build in London? First, I took the data for PTAL levels (the map on the left). Then I took my wards, sliced up to remove any areas that cannot be built on, cut out the Heathrow airport too because it was such an extreme outlier, and worked out the median PTAL level for each one (the map on the right). Click for a larger version. 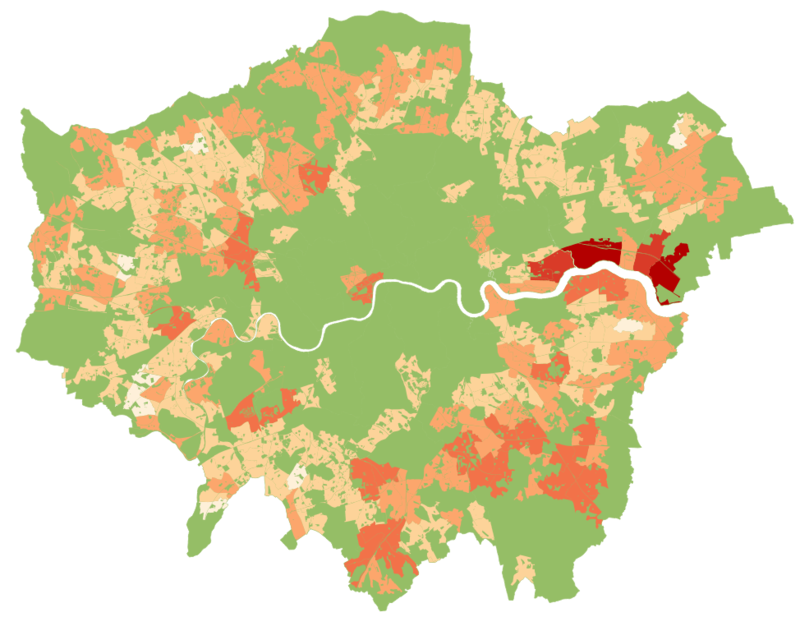 Then I took all the wards where the density was below London’s median. I calculated how many homes you could have, taking the midrange for urban areas for each PTAL level from the Housing Supplementary Planning Guidance (page 32). I deducted the actual number of households from that potential to arrive at the extra homes you could build if you were to bring the areas in line with the planners’ expectations. This would imply flattening the lowest density half of London and building anew at densities between 80 and 225 homes per hectare. The result: an extra 6,500,000 homes! That’s twice as many as exist across the whole of Greater London already. Obviously nobody is about to demolish such an extensive area and re-build it from scratch, and to take every inch of commercial and industrial land for housing and mixed-use development. The environmental impacts of such a huge demolition and construction program would also be ruinous. So it’s a slightly absurd number. But it gives you an idea of what’s possible. Maybe this is what would have happened if we had a sustainable planning system during the 1930s, when these sprawl suburbs were built? One thing to note is that PTAL does not equate to capacity. An area could have an excellent PTAL rating, but no spare capacity on the transport modes nearby. Thanks, it’s a good point. One of the major constraints on much of outer London is the scope for increasing capacity on commuter rail into central London. Unless there is major engineering to create more 18 carriage platforms, or a lot of work to increase employment opportunities in existing outer London employment centres, building that many homes would quickly become unmanageable. One other thing that could help is to invest heavily in improving conditions for cycling. TfL’s study for the “mini Hollands” programme suggests that the most significant scope for growth in cycling is in outer London, with half of trips possible by bike but not taken that way because the road conditions are so horrid. We need to also consider what is know called ecosystem services: air quality, the provision of drinking water, land drainage and waste removal, including human waste. We are only beginning to understand both their necessity and the complex interaction between localised built and green space. Most of the water that we drink falls on the South Downs and the Chilterns and building more reservoirs will not increase the supply. Sewerage is already an expensive problem and air quality is both a legal and a serious health problem. Transport is the very least of our worries ……… or should be. Roy, interesting points to add to the constraints! We have a way to go before this becomes understood. 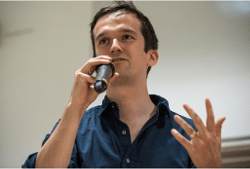 I had the privilege of introducing ecosystems services to the Aldersgate Group – and then recruiting Thames Water to the group – so it’s something that I’ve spent a bit of time with. This organisation, the National Underground Assets Group should be part of the solution! A key consideration in the usefulness of PTALs – and it would apply to any similar level – is the speed with with increases in the standard of infrastructure can be delivered. If you need a new tube line to increase PTALs, it’s going to take a lot, and similarly for major new sewers. Other part of the infrastructure may not be so difficult, and so may not matter as much. As you say, 6,500,000 homes is a rather silly number, so it would be good to have an idea of the rate at which areas have densified, and identifying the factors which permit or hinder densification. That way you could get some estimate for the annual rate at which London could add new houses, with upper and lower bounds depending on prevalence of the factors which help and hinder. I’ve asked colleagues in the GLA about brownfield land, there isn’t a good source of brownfield land data across London. Individual boroughs would hold some. Tim Lund and I are discussing the next step offline, I could keep playing around (it’s fun and I think still valuable) but there may be potential to do something a little more rigorous looking at good and bad examples of densification in the last decade, and borough assessments of future potential.